Coach Estelle | Blog - A New Year, A New You! I just love the beginning of a New Year! I'm always filled with anticipation and energy to clarify my vision, set my intentions and put together a plan of action for what I want to achieve in my life. Before I get started with these activities I always take the time to acknowledge my accomplishments, achievements and celebrations from the previous year and consciously release what I no longer want in my life, before setting my intention for what I do want in the New Year. Here is the 4-step Process that I use to powerfully start off the new year. Begin by lighting a candle, turning on soft music or any ritual that set’s the tone to go inward. When you have reached a place of calm and centeredness begin. What’s not quite right yet? What would make it more right? What are my judgments, feelings, emotions? What miracles happened this past year? What were my accomplishments this year? What are my strengths that I can take into the New Year or new period? What insights have I gained from this past year or period? On a piece of flash or tracing paper, list all the things you are now ready to release from your life. Read through the list and then consciously release it by shredding it or burning it in a fire place. If you have used an ink pen, wash the list or soak it in a bowl or sink of water and watch the words disappear. Option 1 - When you have reached a place of calm and centeredness once again, begin. What is my hearts desire? What does it look like, sound like, feel like? What qualities will I embrace - i.e. health, wholeness, peace, trust, love, etc. What values will be present in my life? - i.e. integrity, honesty, trust, authenticity, financial security, etc. What people will be in my life? What places will I visit? What will have more of? What will I reduce or have less of? Option 2 - When you have reached a place of calm and centeredness again, begin. Write a letter to God, the Universe, Spirit, Life or whatever Higher Power you choose, in gratitude for all that has been received, accomplished, completed, started, everything that has occurred during the upcoming year or period. Use the questions in option 1 above to assist in writing your letter. Sign and date the letter one year from now. Put it in an envelope, seal it and keep it in a sacred place- your journal or other sacred text. At Thanksgiving or at the end of the year, open and read your letter to see what has manifested in your life. 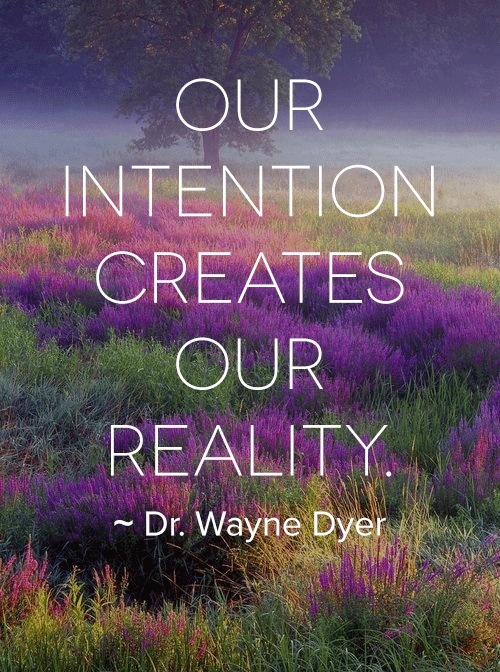 I'd love to hear what you're doing to set your intention for for the new year- share your comments below.